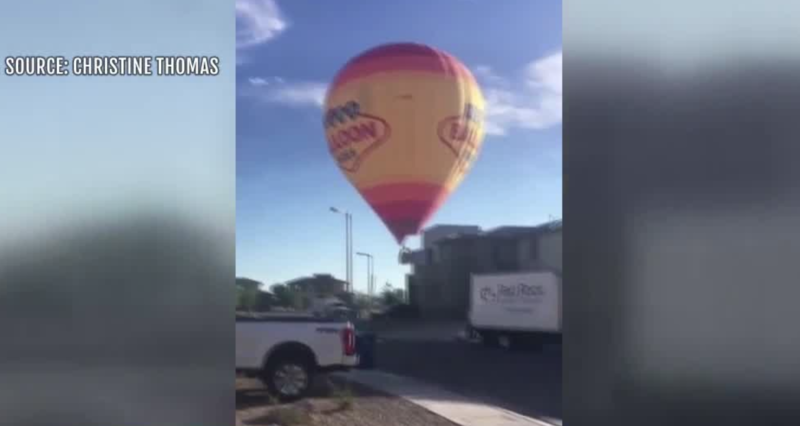 UPDATE JULY 6: Another viewer said a hot air balloon landed in her neighborhood. The balloon landed around 6:30 a.m. Friday in The Cliffs in Summerlin South. 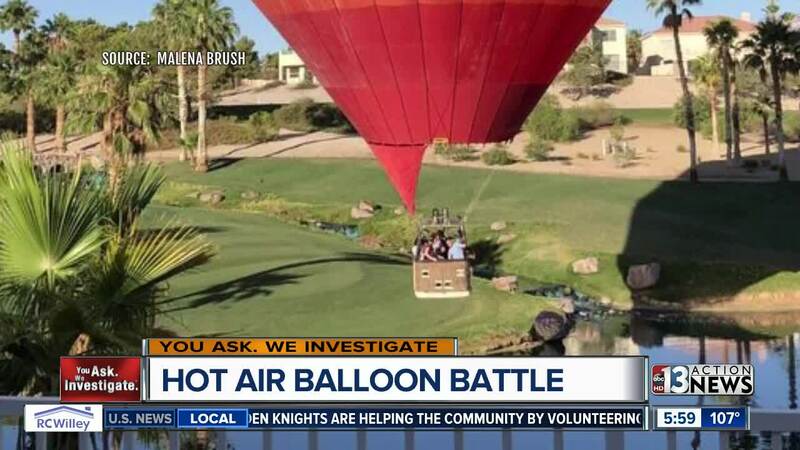 UPDATE JUNE 25: The battle over low-flying hot air balloons in the southwest valley is heating up after a naked woman in her bedroom was startled by a hot air balloon just feet over her home in Rhodes Ranch. One woman says she was asleep in her bed, when a balloon came flying by her window. She tells Contact 13 her blinds were open and she barely had time to cover up and begin snapping pictures of the balloon. Other homeowners whipped out their cell phones to show just how close the balloon came early Saturday morning coming just inches above the water hazard on the Rhodes Ranch golf course. Homeowners say this is an ongoing issue and they fear someone could get hurt while citing privacy and security as other factors for speaking out. Contact 13 sat down with Clark County Commissioner Susan Brager, who represents Rhodes Ranch and surrounding area. "I wouldn't want it be a problem for the homeowners or the balloon riders, because we would never want a tragedy or something like that to happen," said Brager. Brager adds her office has not received a single complaint about low-flying hot air balloons, but will bring up the matter during an upcoming "emerging issue" meeting. “I would speak to the [District Attorney], because we would need to find out what our legalities are, if we put an ordinance on, how do we monitor it?” said Brager about possible issues with enforcement. Brager said once Clark County leaders have a clear understanding of the issue, an ordinance restricting hot air balloons over homes could be put on the books by the end of the year. 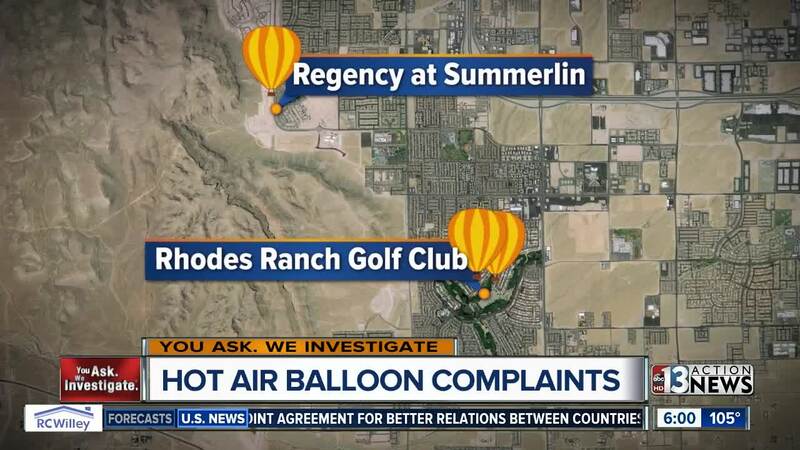 UPDATE JUNE 12: The Federal Aviation Administration says the Las Vegas Flight Standards office has received 3 complaints of low-flying balloons since Contact 13 first reported the issue on June 1. The complaints came from two specific areas including near Warm Springs Road and Durango Drive, and the Regency at Summerlin located near Hualapai Way and Sunset Road. An FAA spokesperson says the federal agency does not comment on investigations or any possible surveillance of operators. 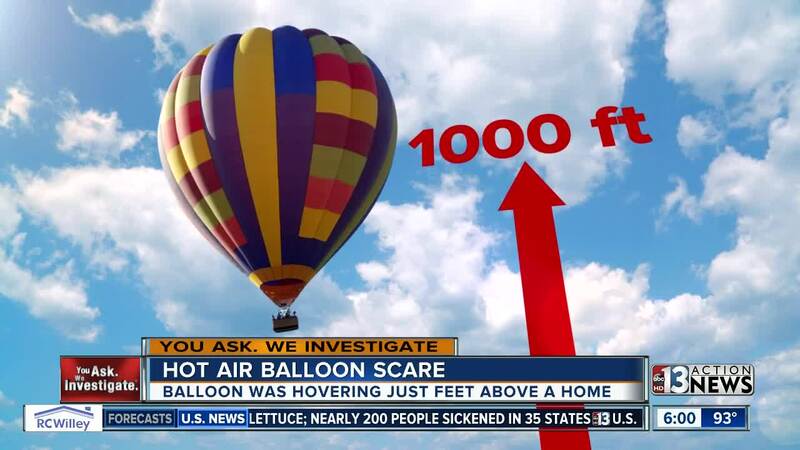 Contact 13 also spoke to the co-owner of the hot air balloon that was spotted flying feet above homes in the southwest valley on May 29 that sparked safety concerns. “We do have minimum altitude clearance, except when we are landing or taking off," said Doug Campbell, co-owner of Las Vegas Balloon Rides. “What the public really needs to understand is, we are not down there in a specific effort to piss somebody off, or to make anybody else happy," Campbell explained. "We are just trying to maneuver a balloon in an area that gives us a safe environment to land," said Campbell. Campbell says the 1,000 foot separation rule from the FAA did not apply to his pilot as he came through Rhodes Ranch to approach a landing zone. “Once a balloon leaves the ground, we can’t steer it," said Campbell. “The wind blows in the one direction and that is how we steer the balloon," he added. Campbell says he has instructed his pilots to avoid flying homes at very low altitudes, if at all possible, and adds safety of the people on the ground and in the air is always paramount. ORIGINAL STORY: A hot air balloon was only feet above a man's home in Rhodes Ranch earlier this week. Marvin Fisch says he was enjoying his morning coffee on Wednesday when he heard the sound of a hot air balloon. "I heard a noise, which I recognized as the burner of a hot air balloon and it sounded very close," said Fisch. He walked out toward his pool and discovered the hot air balloon. "I waved, and that's when one of them yelled, 'Is the coffee ready?' I said 'Yeah! Land on the golf course and I'd be happy to serve you some!'" said Fisch. His morning cup of joe was had to wait as he snapped several photos of the balloon as it lingered over a golf course and then disappeared off the horizon. "I'm not sure why they come down that low," wondered Fisch. "It's more thrills for the passengers, perhaps." Fisch looked up the FAA regulations and found that hot air balloons must maintain at least 1,000 feet above a congested area . However, the FAA says if a balloon is either taking off or landing, they do not have to abide by the 1,000-foot regulation. FAA recommends that if people suspect an unsafe condition or pilot behavior to report it. They can do that by contacting the FAA’s Las Vegas Flight Standards District Office .